We work with local power to give a real Guatemalan experience from a local perspective. Our goal is to ensure that your stay in Antigua is one to remember and there’s never a dull moment. Lemon tree is located in the heart of Antigua, less than two blocks away from central park, on the cooler side of town and walking distance to everything! We are one of the newest hostels in town, where modern comforts meets colonial architecture and where good times meet the history of this world heritage site city. 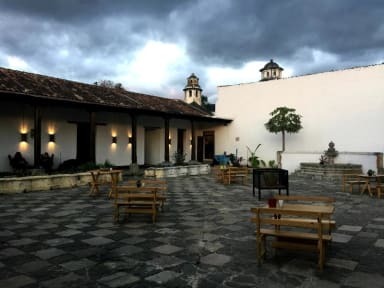 Our neighbours are bars, restaurants, authentic Guatemalan food, ruins, churches and parks with some of the best volcano views and photo ops in all of Antigua. 11 comfortable and spacious rooms are disposed for guest to to stay at Lemon tree hostel. At the guest house, the rooms are equipped with a patio with pool view. Featuring a shared bathroom, rooms at Lemon Tree Hostels also provide guests with free WiFi. Payment upon arrival by cash and credit cards. We accept dollars but change will be given in Quetzales. This is a great place. My favorite hostel in Antigua by far. Super clean. Really nice environment. Thank you for being there! Very chill, clean, great staff! Very friendly people working there, I remember the girl from Leon-Nicaragua, and one more local girl living in a village close to Antigua. The hostel has a lot of space, comfortable bed, bathrooms very big and clean, the wifi was ok, sometimes not good where my bed was, but still fine. Definitely a place to stay with a great location. Is an excellent place, three blocks away from the main square. The two girls are the main door were amazing. One recomendation to the manager, try to instal a kitchen for the guest. Dead atmosphere but it is low season. Clean dorm. I was the only person in it which was fine for me as I wanted quiet, but if you’re looking for a more sociable place don’t stay here! Girl who works there is super super lovely. We stayed for 3 nights. It's a very clean hostel with plenty of toilets and showers. Showers are lukewarm. 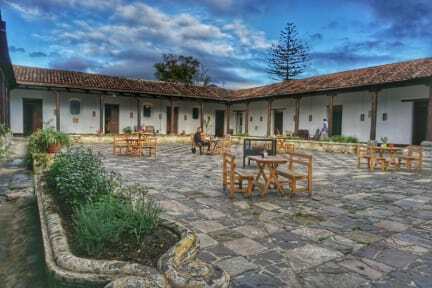 This is a very quiet hostel with little atmosphere - probably best for Spanish lessons or resting after hikes. We didn't use the kitchen but noticed there's no fridge. Beds are very comfortable with curtains, plugs and a light. There is a very good selection of activities and shuttles available from this hostel.